It’s time for another film based on true events. For once, it’s not about a moment of great importance in history or even about a heroic protagonist who helped reshape the rules and standards of life as we know it. Instead, this film is about two outlaws who were not heroic in any sense of the words and got their thrills out of robbing and committing other crimes. As such, you can imagine that it was not really my kind of film as I never care for villains as the protagonists. Bonnie was originally a waitress who wasn’t involved in a life of crime. That changed when she met Clyde who tried to rob her mother. Bonnie was intrigued and decided to join in. While the pair initially committed small crimes that didn’t involve murder, they eventually grew bolder and bolder. Once they crossed the final line for the first time, it was relatively easy to keep going as they grew worse and worse. Ultimately this would be their undoing as they made too many enemies and got caught in a trap. You couldn’t feel any sympathy for them at this point since they were completely evil and it was a good way to remind the audience that crime never pays. You end up paying for the crimes..with your life! I’m sure that the film is fairly faithful to how the pair acted back in the old days. Neither character is likable in the slightest. You just feel bad for their victims like the guy who was shot in the face. It’s why working in a bank isn’t exactly my favorite job in the world. It’s tough to deal with robbers and you never know how it’ll turn out. The film puts a lot of emphasis on how sketchy the two main characters are. Aside from breaking the law and all, they also smoke, drink, and do everything you’d expect two villains to do. The “romance” if you can call it that is fairly prevalent as well. The leads have all the wrong priorities the whole time. The film certainly was on the gritty side. 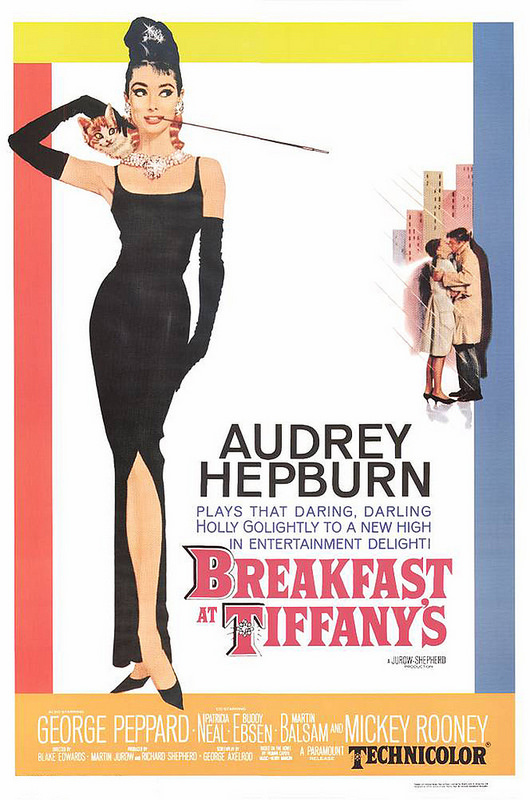 It had that old grainy look to it that most early color films had. It automatically helps a film appear to be more gritty and especially if that’s how the film is trying to be. You can especially see this in horror films and it’s why the modern ones are usually more chuckle worthy than anything. It’s the one time Indie can try to shine as their films are usually low budget and can still attain that grainy feeling. It’s not as if I’ll like a horror film anyway, whether it be grainy or clear, but definitely something to think about. Of course, an old grainy wild west film with two villains as leads…that was never going to end well. I mostly don’t take too many shots at historical/documentary films like this one since they’re usually uplifting stories with good morals. As long as the adaption is on point, it’s all good. This one’s a bit of an exception since their are no good morals or stories to take from this one and I don’t even see why this story had to be adapted. Why should we honor criminals with their own film? I definitely don’t understand it and so even if this film is fairly accurate to how they would have acted, I can’t say that I’m a fan. This just wasn’t my kind of film. As a side note, it’s always interesting to see the old style of cars that everyone uses here. I sort of like the design, but at the same time the colors always seemed faded. It’s like colors just didn’t stand out back in the day, but I don’t see why that would be. Had we not developed shiny colors at this point in history? It seems like something that would be fairly easy to do. I can see not having bullet proof windows and all of that fancy stuff, but shiny colors had to have been one of those easy inventions that just hit someone like a bolt of lightning someday. It just seems like walking around in those days with faded out colors made everything else seem fake as well. In theory all of the colors should still be sharp so maybe we had sharp colors and films just couldn’t properly see them? Like I said..it’s something to think about and you should think about it during the film since it’s more interesting than the actual movie. 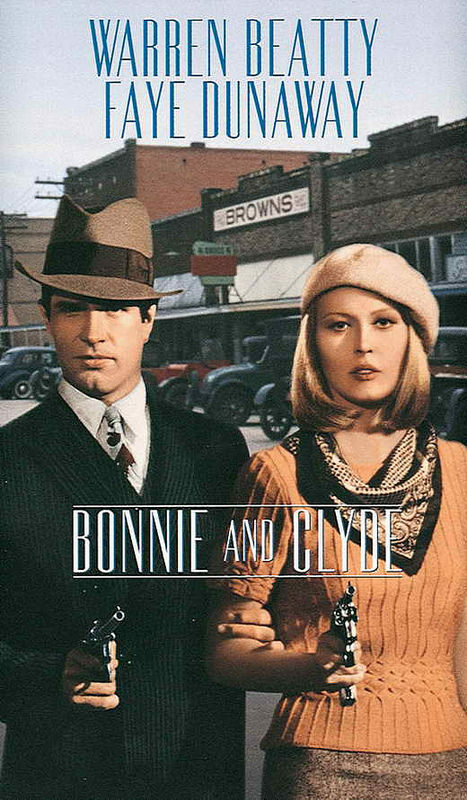 Overall, You should avoid this Bonnie and Clyde film. I don’t see how any film could manage to make them likable anyway since the story is just about how they’re evil and kept on shooting people and stealing money. Switch out the names and you just have two very generic criminals in the olden times. There were many criminals in the Wild West as you can see from any old film. True, this might not be quite the same Wild West as it wasn’t that old and uncivilized compared to other eras, but it’s old enough where I just generalize and call it that. If you really want to learn more about Bonnie and Clyde, then this is probably a decent way to do so. At the same time, you could probably just watch a documentary instead and in this case it may work better. We don’t need to learn all that much about their friends and personal life. A documentary will just stick to the facts and probably be more concise about the whole thing. It’s time to look at an underrated movie. 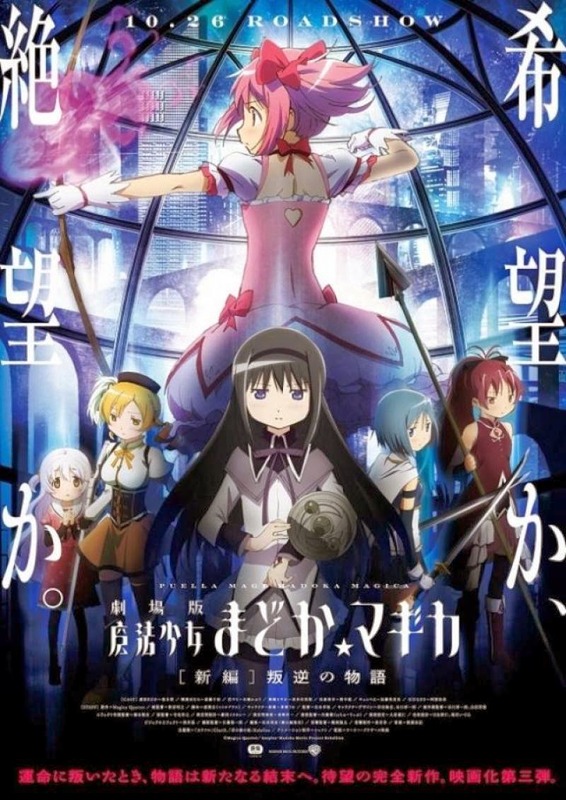 Madoka Magica Rebellion’s ending was a very controversial one that had so many hidden meanings and subtext within each action that the fan base has written many theories on it. They were all pretty fascinating and it’s great to see everyone add more and more depth to the film. The reason they can do that is because the ending was so good and it was very unique. This editorial will naturally have heavy spoilers for Madoka, but also for the movies Bridge to Terabithia, The Amazing Spider Man 2, Batman V Superman, Don’t be Afraid of the Dark, Pay it Forward and several others so prepare yourself! 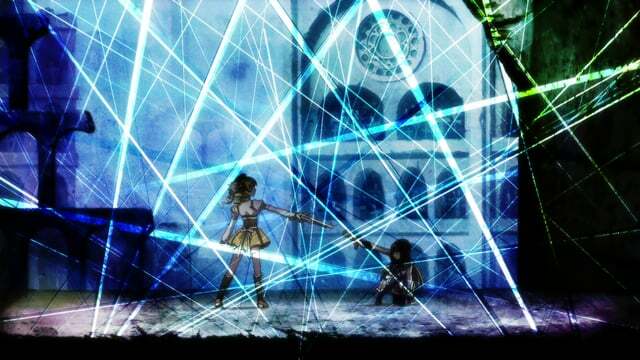 Rebellion takes place after the original Madoka Magica show. The title character of the series ultimately decided to ascend to a higher realm and became a concept of life itself. She became a living embodiment of hope who erased the cruel fate of magical girls that forced them to turn into a witch once they ran out of energy and despaired. Unfortunately, quite a few of the magical girls had already died and now Homura was the only one left to deal with the hordes of enemies that had been left. Witches were gone, but they were replaced with a form of demon. The average franchise would have left things like this. Homura would gradually accept the reality that Madoka is really gone and help to protect the world until she ultimately died someday. Once she died, she would be able to be with Madoka to an extent since she will be past this realm, but maybe not. Now that Madoka is a force of nature, her fate is eternal and she will never get to have any rest as she constantly absorbs the evil nature of Witches so that they never exist. The world may be a Utopia, but there is still one person who didn’t get a happy ending…Madoka. In Rebellion, Homura decides that this isn’t acceptable. So, Homura created a prison within her own head thanks in great part to Kyubei and didn’t even realize it. After escaping from this, Homura was finally granted an audience with Madoka. The whole episode had such large ramifications that even a cosmic entity was summoned. That’s pretty impressive eh? Now Homura has the ultimate choice, take Madoka’s hand and join her in the eternal beyond or drag her back down to reality and shift the fabric of the universe once more. 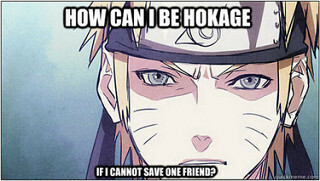 Obviously, Homura has to choose the former option right? It is a metaphorical necessity as it is the only way Homura can truly move on. She must accept her friend’s death and then go back to living normally. Bridge to Terabithia believed in this message wholeheartedly and had the viewers say goodbye to the main heroine by the end as she plummeted to an unfortunate (Film wrecking) fate. That’s the popular way to deal with this kind of film. It’s a great way to end the film on a sad note and remind the audience that they shouldn’t have bothered to go see it at all. It’s like offering someone a nice bag of chocolate chip cookies for after dinner, but then dumping the bag into a box of salt first. You may need to eat the cookie anyway because it’s the nice thing to do, but it doesn’t make a whole lot of sense. Other films like The Amazing Spider-Man 2 have done this as well with the main heroine dying towards the end and the hero having to get past this. It always happens a little too fast though, but when should the hero get over it? Obviously, you have to move on at some point…or do you? 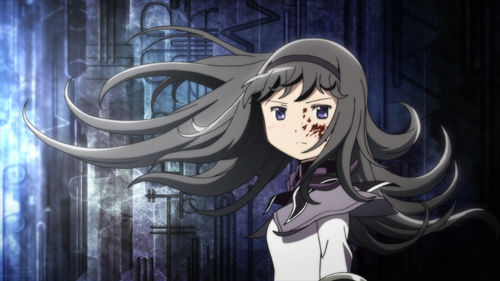 Homura was in a unique position to actually get a second chance and decided that she wouldn’t simply wait around and accept the fact that Madoka could never rest. That’s why, bringing her back down to reality was in fact…the right move! Think of it this way, how can you not save someone when you have a chance to do so? Think of any classic superhero film where the hero decides to risk everything just to save one person. It’s true that you may be endangering hundreds of people just to save a single individual, but is it not still worth it since 1 life is worth just as much as 100? Madoka didn’t have a happy ending so even if everyone else was pretty happy, it just couldn’t fly. Just to add salt to the wound, Homura’s Utopia also seems to be a little better than Madoka’s. Now, this could be temporary as Witches should theoretically return without Madoka’s new concept, but what if Homura found a way around that? It’s unclear how since Homura shouldn’t have as much power as Madokami. Most likely, Homura’s chance is going to have a lot of bad side effects, which will get dangerous. Of course, there is no sequel yet so maybe not. We are free to theorize at leisure now and I think I have a reasonable solution. Madoka still has her Kami powers as seen in the end where she starts to regain her memory. Since she still exists as a concept, the witches are still kept at bay. The only difference is that she’s still allowed to have a school life as well in the mean time. Then, Homura has really done it, she’s made a perfect world. Then why isn’t everyone happy about that? Well, there is one big problem which keeps you from seeing this as a good thing. Homura is really doing this against everyone’s will. She got rid of Madoka’s memories so that everything will play out once more although Homura herself will have a different role this time. Controlling others is never a good thing no matter what the reasoning (excuses) are. You can never spin that into being the right thing so Homura definitely went off the deep end here. She started out with good intentions, but throwing in unlimited power to the mix clearly unhinged Homura and started her down a dark path. 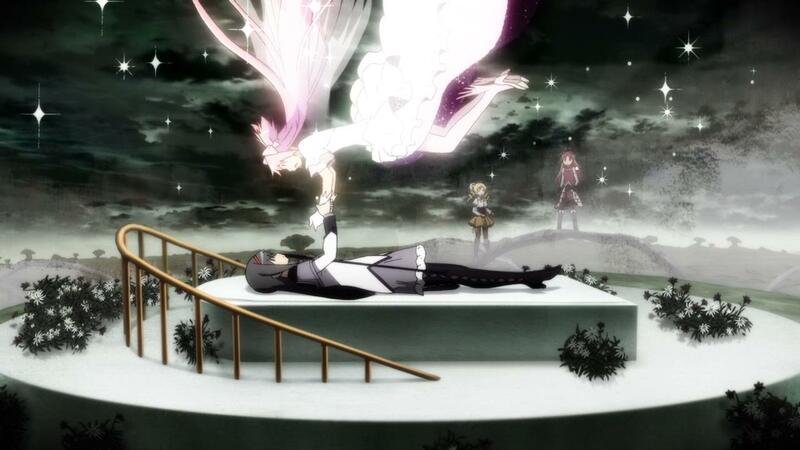 The original action of dragging Madoka back to the Earth even though she clearly didn’t want that? I can actually buy into this. One common misconception is that you always have to follow someone’s wishes even if they clearly aren’t good ones. Just look at Attack on Titan where Levi and friends told Eren not to help his comrades so they can be eaten. They wanted Eren to run away so the Female Titan could eat them first while the hero escapes. Eren listened for a while before finally going into action, but it was way too late by then. Dragon Ball Z is another good example. In one scene, Vegeta is getting pummeled by Cell and Trunks decides not to help because Vegeta’s pride would be injured if he had to get saved. Well, better that his pride gets hurt than his life gets lost eh? I mean, it worked out, but what if Cell had destroyed Vegeta? I guess they could write “He died with his priiiiiide!” on the tombstone. Nah, sometimes you have to go against someone’s wishes in order to save them. It’s like restricting cigarettes and beer from a teenager or making sure that a kid doesn’t get to play with sharp objects while he/she is too young. Even once the individual becomes an adult who can make his/her own decisions, you may have to help keep that person on the straight and narrow. That’s why we have laws and regulations. Madoka’s a nice kid and it’s cool to see her want to help everyone out, but heroes like that don’t typically think about how to protect themselves. That’s why you need a friend who’s got your back. In this case, Homura was the only one in a position to do anything about this. Madoka definitely didn’t want to come back to Earth since it could put her friends in danger, but how can they really enjoy this perfect world if they know that she didn’t get to partake in it? Going to any and all lengths to help a friend is what really defines their bond. A big trend in many movies is to have the hero abandon the friend in a Flee or Fight moment and it’s praised as the right call. Even Dragon Ball Super recently had a moment like that where someone stayed behind to get massacred so that the hero could run. Luckily, he chose not too, but he was too scared to actually help so that’s nearly as bad. There are numerous examples of this, but I’m struggling to recall any at the moment. It’s the curse of the writer! I’m sure that many of you can think of times like this though, where a friend is alone against terrible odds and tells the main character to go off to stop the main villain anyway. This dooms the friend in the process, but at least the world is saved so it’s all worth it. Well, I’m here to tell you that this is the wrong call. Prioritizing the friend’s safety over the world’s definitely comes first. If you can’t manage to save your friend, then does the rest of the world really matter? Most characters come to grips with the opposite reality and justify their move by saying that the Earth was saved and that the friend would have wanted it that way. Sure, the friend is typically a noble character who is okay with dying, but as a friend to that person, you have to save him/her. At the very least, Homura made sure to keep this priority in mind. So, that’s my spiel on why Rebellion’s ending is actually pretty fantastic. It broke the usual norms of the average film and decided not to be content with having Homura pat herself on the back for getting over Madoka’s death and going back to her day to day life. Way too many films do this and having a major/likable character die towards the end of a film is not a good way to end things. It may work for Oscar bait and it may make people appreciate the character more in retrospect, but it also runs the risk of damaging the entire film. The Forest, Don’t Be Afraid of The Dark, Bridge to Terabithia, Pay it Forward, and many other films decided to end with one of the main characters dying and they handled it horribly. Dooming those films to really low scores when they could have been semi decent. Don’t even get me started on Marely and Me or the Old Yeller. If these films had ended with the character living in the end, it could have made a big difference. At the very least, Bridge and Marley would have had positive scores in the end. I can’t really vouch as much for the others. Can a hero’s death towards the end of a film be handled well? Of course, but it takes skilled writers. Batman V Superman is a great example of this. Superman died (for around 30 minutes) and it didn’t destroy the movie. Part of this is due to the fact that Superman knew the risks and the death wasn’t pure shock value. It wasn’t there to be super sad and emotional, but just to remind us that Batman’s the money factor in the DC universe, not Superman. In the comics, Batman semi recently went to great lengths to try and bring Damien, one of his new sidekicks, back to life once he died. In a universe where people are constantly bringing people back to life and there are many individuals who can do so, I would expect nothing less. If you have a really good friend and don’t try to bring him/her back to life in the comics universe, then I’m definitely going to doubt that bond. Homura decided to change things even if it put the rest of the world in a dicier spot. Granted, she also turned evil by the end and completely cracked so now it’s going to have to be Madoka’s turn to try and save her once more. This circle should theoretically continue to repeat over and over until both of them are dead. An ending can make or break a film and this has always been the case. It’s a crucial element to any title and it’s important to get it right. What defines a good ending? That may be a topic for another day as there are many variables. One thing’s for sure, Rebellion gets my seal of approval and will go down as one of the better endings in a film. It was unexpected, it was hype, and it shattered the tropes! It’s time to look at an anime that’s a little different from the average title that I review. For starters, this is not an action anime. This is a tragedy mystery story where a guy must try to repair the lives of 3 girls and their respective families in the process. It’ll be tricky and the show will take you on quite the roller coaster. It’s definitely a solid title and a show like this can be a nice change of pace, but unfortunately it is hurt by the terrible ending. I had to slash away a full 2 stars on account of that and was tempted to take more away, but the rest of the show had been consistently good and the ending, while dark, could have been darker. 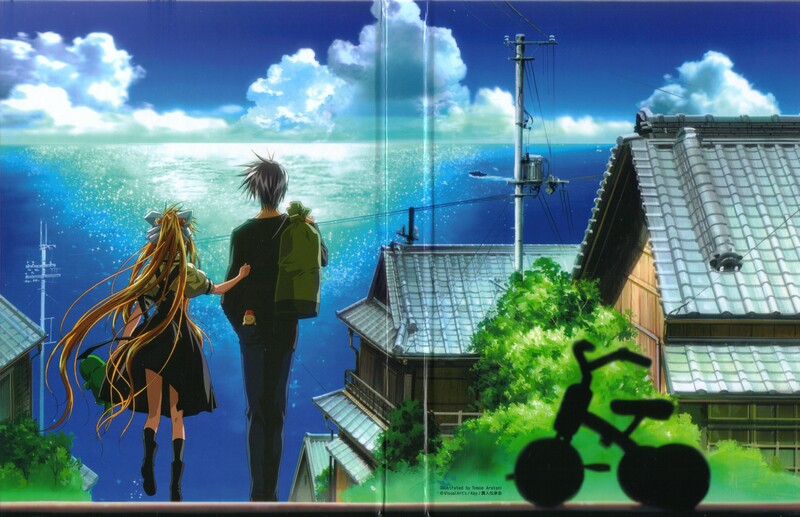 Yukito, a homeless guy with no possessions or money, finds himself in a small town after walking for a very long time. His mission is to find a girl with wings that his mother told him about. He doesn’t stop to question if this was literal so he continues to search. 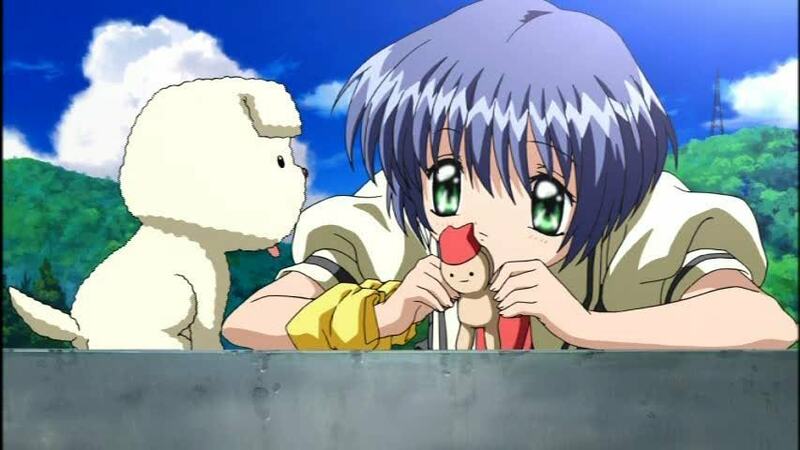 The main problem is that having no money really limits his options so Yukito tries to put on little shows with his telekenetically controlled puppet for the kids so they can pay him. As you may expect, this isn’t his greatest plan and he never makes any money off of it. Luckily, a nice girl by the name of Misuzu shows up and offers him a home and 3 square meals in exchange for being her friend for the summer. Yukito grudgingly agrees and so begins his adventures in this crazy town. The show really has 3 main arcs, one for each dilemma so let’s take a look at each one individually. First up is Kano’s plot. Yukito was given a job by her mother (or if not mother, a close relative) Hijiri. His job is to do odd jobs around the house and to entertain Kano at times. Unfortunately, it turns out that Kano has been cursed by a feather and has a split personality. This new personality shows up once in a while and tries to destroy herself. If she is not cured soon, Kano will end up being gone for good. As you would expect from Air, there are quite a few fakeouts and even a scene where you’re led to think that Kano’s other side may have succeeded. It’s definitely tricky to stop Kano when she’s always vanishing and her alter ego has super strength as well. One grab was nearly lights out for Yukito…permanently. The arc went over smoothly though and the resolution was good. It definitely had its share of sad moments, but had a happy ending in the end. Next up was Minagi’s plot. Her mother suffers from forgetfulness and has been unwilling to accept that one of her daughters died at birth. As a result, she believes that Minagi is actually her dead sister. As a result, Minagi’s been forced to assume this identity for years, resulting in a very awkward dynamic in the house. Things get worse when the mother finally realizes that the sister is dead, but then goes to the other extreme as she forgets that she ever had any daughters. Distraught, Minagi is forced to move out and live at an abandoned train station. Now she’s finally in Yukito’s home turf so he decides to help out a bit. He gives her the option of leaving the town with him or finally confronting her mother about who she is. There is also a plot twist about Minagi’s friend Michiru who happens to have the same name as the dead sister. Makes for an interesting dynamic although it leads into the arc’s sad ending. It’s sad, but at least it’s not tragic and all of the characters still had a good time in the end. Minagi is also given a nice epilogue as she leaves this mysterious town and gets to go to a happier place and meet up with some relatives. It was another solid ending to the arc. Next was the big final arc and unfortunately, it was the one that didn’t go over so well. Misuzu has a unique condition, derived from a curse and a fate of an infinite time loop of very limited possibilities. She can never get a friend as she suffers from painful spells and seizures whenever someone gets too close. The curse also gets partially transferred so if someone wants to be friends with her anyway, then they will both die. There is no way to break the curse and Misuzu is even given the extra discomfort of knowing when she will die. As the show repeatedly states on this tale being the 1000th summer and how this show is essentially about having the best summer ever, it is also her deadline. Misuzu will not outlast the summer, try as she might. She will also have to continue to die every summer, forever and ever. Meanwhile, her aunt Haruko has decided to never get too close to Misuzu. She inherited Misuzu when the girl’s mother died and her father decided to run off. The problem is that the Dad could reclaim her at any time so Haruko didn’t want to get attached. As a result, they’re on good terms, but you couldn’t really call them great friends. They each lead their own lives. As a result, Misuzu’s been all alone right from the start. Nobody even wants to be her friend no matter how much she asks. Well, Yukito’s helped out a few people already so this shouldn’t be a problem right? Well, unfortunately this is not the case. In fact, he just adds to her troubles by helping her emotions seesaw all over the place as he leaves and returns multiple times. In the end he realizes that this was a mistake and wishes for a do-over, but things don’t go as planned. Now, it should be made clear that Misuzu did get to have some fun in the end and you’re supposed to be content with the fact that she finally got to walk and go to the beach. If there was never any hope given for her to avert this fate of death then that probably would have been okay. It would have been a little more somber throughout, but so long as the core anime was not really changed, it may not have affected the score all that much. Unfortunately, the show keeps on giving you hope that the powers of friendship will be able to free Misuzu. There are dozens and dozens of fake outs that keep occurring and the viewer is left to think that we have finally made it past the darkness and into the light. Over and over again until you finally realize that the anime has just been toying with you from the start. Yes, I’m still irritated at the ending and just thinking about it makes me annoyed. It doesn’t help that this infinite loop of 1000 summers will never end. If you decide to believe that the kids at the end are the final reincarnations of the two main leads, then it’s possible that this was the final death Misuzu had to endure and now she’s free. It’s a bit of a stretch if you ask me though and either way this version of Misuzu will keep on dying. If Yukito had found Misuzu’s winged form after being given a random speech in the final minutes of the show, then that would have helped to clear things up quite a lot. Instead, it turned into another fruitless search for the guy. Still, as a lead, Yukito is a good protagonist. I found him to be a lot more enjoyable than the guy from Kanon as he was nicer and more understanding. He did his best to help all of the characters out and did so without having to flirt with everyone. He helped the other characters out as a good friend and he got a pretty sad fate in return. Ah well, he was never looking for a reward in the first place. He’s not too smart though as trying to earn a living by entertaining little kid in exchange for their pocket money will never work. Not to mention that his show was rather lackluster since he could only make his puppet walk back and forth in a straight line. In his second reanimated form, he lost all of his personality so he couldn’t really add much to this. Misuzu’s a solid heroine as well. I found her to be more likable than any of the other girls. As we get to see her events twice, once from an outsider’s point of view and one from within, she does a good job of keeping up a brave face even when she’s feeling down. She’s had a rather miserable life after all, but always does her best to make the most of it. She turns sad ending into a happy one for herself. The only time I found Misuzu to be annoying was when she lost her memories as she suddenly became a mean person. I don’t think memory loss should change your core personality and subscribe to the Medaka Box theory instead. I feel like Misuzu would still be super polite even if she had no idea what was happening. Regardless, her likable personality is why I was hoping she would have a happier ending. Kano’s not bad either as she would love to fly, but real world physics don’t allow it. Her dog, Potato, is pretty cool and Kano’s nice as well. She just never got a whole lot of personality besides being a nice person. I guess the split personality counts, but luckily she grew out of that. Her mother, Hijiri was good as well even if she never actually got to even try and help out Misuzu. She’s a doctor so it would have been nice to have seen her make an attempt even if Misuzu claimed that it would be of no use. 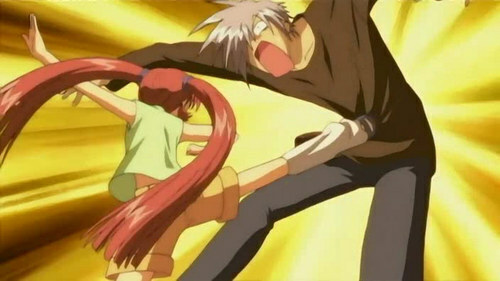 If there’s a character that’s a little weak in this series, it would be Minagi. That’s more due to the fact that I don’t really care for soft spoken characters though. There’s really nothing concrete to dislike about her and she has a lot of things to deal with as well. She’s always glad to help out someone in need with free coupons and a place to stay. 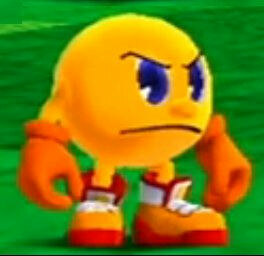 Air doesn’t just give characters annoying gimmicks to make them different. The show did a really good job of making everyone very nice and sincere even if they end up being pretty similar at times as a result. Michiru was more entertaining as she was very over the top. She constantly beat up Yukito and the two of them were always getting into fights until Michiru became super serious towards the end. She certainly had a lot of energy and I was glad that she channeled it into productive things like blowing bubbles as opposed to constantly accusing Yukito of stuff that he wasn’t guilty of. That would have gotten old very quickly if she hadn’t stopped. Haruko is Misuzu’s aunt and she gets a very large role in the last 2-3 episodes. She started out as a supporting character and quickly replaced Yukito as the main character once he died and reincarnated the first time. The new scenes gave her a lot of extra character development and ultimately turned her into the best character in the show. She drinks a lot and certainly isn’t the most responsible parent. It took her a while to realize that she should be more helpful, but was better late than never. The ending is particularly rough on her since she will always have some regrets as a result, but at least she’ll have a few fond memories from the last days. As for Misuzu’s dad, the show tries to make him seem like a reasonable character, but it’s hard to buy it. He completely ditched her for 10 years and shows up out of the blue to take her back. If she hadn’t gotten amnesia at the time, his offer would have completely been rejected. He never even has any defense to explain why he left. I’m glad that he didn’t appear as a super evil character or anything like that, but there’s no way that you can root for him by this point. There was also a random flashback mini arc that happened after Yukito died. It involved three new characters which included the original winged girl, Kanna, her friend, Uraha, and her bodyguard Ryuya. They decide to flee the land so they can have some happy adventures, but they’re caught and Kanna is destroyed. The other two decide to have a kid so that he can keep on being reincarnated to protect her future versions. It’s a very flawed plan at best. This episode gives you some extra context I suppose, but honestly I’d call it total filler. These guys will never show up again after all and they weren’t useful in the fights. Kanna and her Mom could level mountains with a single slash and yet they die to a casual arrow? That was probably the worst showing that I’ve seen from such a powerful being in some time. Not to mention that the Mom could have mentioned that she was cursed before Kanna made contact with her. It would have been more effective than simply saying “Don’t touch me” for no real reason. The show did do a good job with the following episode though as it played out like a bit of a mystery. Why are we reliving the first episode? Has Yukito been given a chance to change everything? At first it seemed like that, but instead he gets a double take in addition to his original version so there are now two of him living in the same place and time as each other. It’s a pretty novel concept and as mentioned earlier, it’s interesting to see everything again from a new angle. If only the ending hadn’t spoiled its efforts. The animation looks good. It’s not particularly awe inspiring, but it does look a little retro. (In a good way of course) We do get a quick action scene that is good and the character designs are all solid. I enjoyed the soundtrack to an extent as well. The themes in the actual episodes are all forgettable, but the opening is good. It’s an emotional theme that fits very well with the episodes. As a result, it’s not something that you are likely to listen to for fun at any given time, but if you just saw an emotional movie, then it’s a fitting theme to look up on Youtube. As for negatives, there really isn’t much here. There is a little fanservice as characters dramatically shed their clothes to embrace the sky as they fly around. The aunt is also very casually dressed so she isn’t wearing much most of the time. Luckily, this show isn’t a shonen so the camera angles never really focus on it. I am still of the opinion that a risque costume does not necessarily have to be fanservice as long as the camera handles it appropriately. Air is a good example of this. There’s certainly no problems with language or violence here. This is something that you could easily show a kid although he/she would likely get bored due to the limited action scenes. In the end, how does this compare to Kanon? Well, Kanon takes the definitive win here, but it’s not a lopsided contest by any means. Air has the better characters including the lead and has a better resolution to most of the plots. Kanon counters this by having the far superior ending and much better animation. Kanon was a lot sadder than Air despite the ending, but I’m not sure if I’d really call that a good thing per say. The soundtracks were more or less equal. I think “Ugu” beats “Gao” as a character gimmick as well. Really, the only thing separating these two series is the ending. Without it, Air actually takes the solid win here. After all, with better characters and better arcs, how could it lose? Kanon does have less filler though so that’s something to consider. 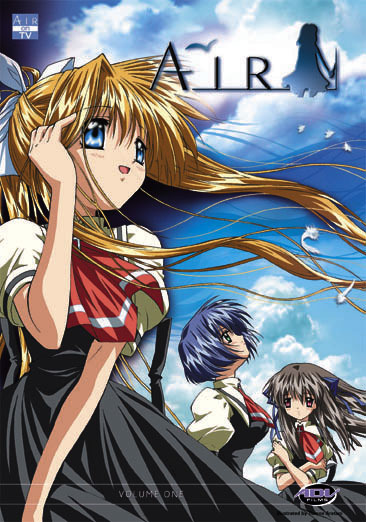 Both deal with amnesia plots, but Kanon’s was more enjoyable. Overall, Air is a solid title, but the ending really saps the joy out of it. As they say, an ending can make or break a title. It breaks this one, but it still makes for a good ride to I’ll recommend it to you all. If anything, just watch the final episode until the initial commercial break and you should be okay more or less. It’ll have ended on a much better note for you or even just ending on the second last episode although I forgot exactly what the cliffhanger there was. The town’s certainly very deserted so it makes you wonder how living there would be. I doubt the wifi signal would be all that good so you could forget about online gaming for the most part. With this title down, it’s back to action titles. Still, we’ll see if the next tragic title can beat this one. It’ll likely all ride on the ending rather than the journey, but you never know.